The database writer plugin is a plugin for Virtual Radar Server that will record flights and aircraft in an SQLite database. The schema of the database matches the schema established by Kinetic for their BaseStation program. Virtual Radar Server uses the records in the database to produce its reports. If you are using Kinetics' BaseStation program then it will already be maintaining a database for you. If you install this plugin and use it to update the database that BaseStation is also updating then you will ruin your database. The Windows installer for the plugin can be downloaded from the download page. Close Virtual Radar Server before running the installer. When the installer asks for the installation location select the same folder that you installed Virtual Radar Server into. Ticking this box switches the plugin on, removing the tick disables the plugin. The plugin will not update the database when it has been disabled. By default the plugin will not update databases that it has not created. If you want to use the plugin to update a pre-populated database that you have downloaded from the Internet, or a database that you have copied from another computer, then remove the tick from this field. The plugin can only record the aircraft and flights from one receiver or merged feed. Select the receiver or merged feed that you want to record from the drop-down list. Enter the full path and filename of the database file here. This field is linked to the Database filename field in the Options | Data Sources options screen. Whatever you type in here will appear in the server's configuration, and vice versa. This means that if you use the Database Writer plugin then it will always be updating the databas that Virtual Radar Server is reading aircraft information from. This link pre-fills the Database filename field with the name of a file in the Virtual Radar Server configuration folder. Virtual Radar Server downloads registration details for aircraft that your receiver picks up from an online database. It caches those details locally so that it doesn't have to keep looking them up. If you tick this option then Virtual Radar Server will write the aircraft details into your BaseStation.sqb in lieu of a separate cache file. The reports that Virtual Radar Server generates come mostly from BaseStation.sqb. If you find that your reports are not showing registration details then it will be because there are no registration details in the database. Ticking this option will tell Virtual Radar Server to fill those details in. If you are using a third party program such as Active Display to populate the aircraft details in BaseStation.sqb then do not tick this option. Ticking this option tells Virtual Radar Server to refresh the lookup details for an aircraft record once they are over 28 days old. This is normally a good idea and the majority of users that tick Save online lookups in database should also tick this option. 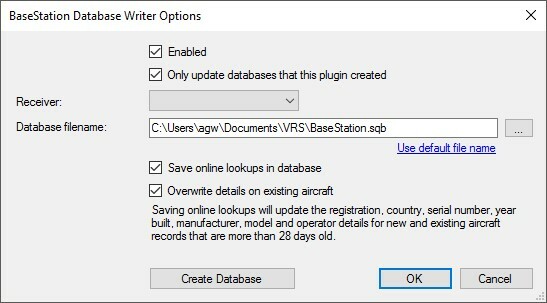 However, if you have some other source of updates (for example, if you are using the Database Editor plugin to make manual changes to aircraft records) then the Database Writer plugin could end up overwriting your updates with details fetched from the online lookup. In those circumstances you should not tick this option. This button, when clicked, will create an empty SQLite database file using the name and folder from Database filename. Only click this button if you do not already have a database.